This collection of beautiful health-enhancing affirmation cards could help improve your mental, emotional and even physical well-being. An additional FREE audio recording of the affirmations will help retrain the brain to use less stress-inducing self-talk. Whether you are aware of it or not, you are talking to yourself all the time. The trouble is, studies show that most of our thoughts are negative and very repetitive, creating a lot of self-induced stress. This of course can impact negatively on your mood, health and well-being, even triggering or exacerbating physical pain. The use of carefully chosen supportive affirmations is one way of helping to develop more health-enhancing self-talk, which can help you overcome any fears and beliefs you have about your symptoms and your diagnosis. This collection of health-enhancing affirmations could therefore help improve your mental, emotional and even physical well-being. 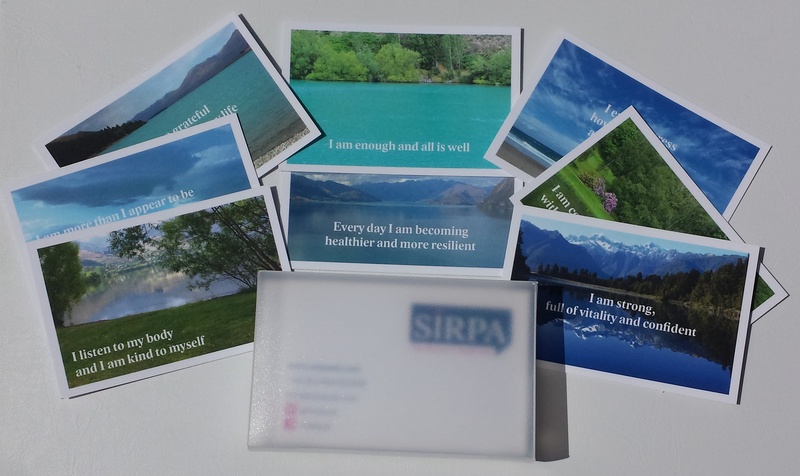 Whether you are following SIRPA’s pain recovery programme or just want to improve your mood and general health and well-being, using these cards regularly could help, while also helping to boost your resilience against the day to day stresses you face. Repetition and persistence is important as you retrain your brain, which is why we have included two sets of 8 different beautiful scenes with carefully chosen affirmations to leave around the house etc as well as including an additional free audio to help reinforce them (see below). Place the cards in prominent places around your house, car and workplace as a reminder to frequently say them out loud, or even inside your head. Sticking one on your bathroom mirror can help break a habit of going into a negative thought spiral once you wake up, reminding you to be kind to yourself and use health-enhancing self-talk. Looking into your eyes in a mirror and repeating an affirmation with feeling can enhance the impact in the short and long-term, as you retrain your brain to be more positive and boost your self-esteem. You might also want to use the ‘third person’ at times too, such as ‘You are enough’ as well as ‘I am enough‘, because we all like to hear positive things about us from others! In order to make it easier to reinforce these simple, yet health-enhancing affirmations, we have included a free 6 minute audio recording of the same affirmations which you can play in the background, for example while you are getting dressed in the morning or while driving in the car. You can just have it on in the background or you can listen to it actively while also repeating the affirmations in the spaces provided after each statement. When you purchase these beautiful affirmation cards you will receive a link to download the audio recording of the affirmations immediately so you can listen to them while you wait for the delivery of the cards themselves. Please note – After you have purchased the affirmation cards your free bonus recording will be sent to you in an email to download at your convenience.